Abstract. The different kinds of gold nanoparticles – covered with SiO2 shell and located on the SiO2 large nanoparticle-carrier – were synthesized and used as antiviral agents against adenoviruses. Both antiviral effect and virulicide action of the nanoparticles were studied in the work. It was shown that both types of nanoparticles demonstrate antiviral action. The dependence of antiviral activity of nanoparticles on their concentration was studied. The nonmonotonic dependence of the antiviral effect on nanoparticles concentration has been observed and discussed. The antiviral action of complex nanoparticles against adenovirus is important because of low toxicity of the gold nanoparticles covered with SiO2 shell and of Au-SiO2 carrier nanoparticles. Keywords: nanoparticle, adenovirus, local-field, antiviral therapy. Nanoparticles and nanoparticle systems are intensively studied for antiviral therapy last decades [1-5]. There are at least two directions of the studies that can be pointed out. The first one is related to the nanoparticles modified with different organic molecules [1,2]. The modified nanoparticles can affect the viruses due to chemical interactions between the molecules-functionalizers and molecules-receptors at the virus surface. The second direction is concerned with antiviral activity of ‘pure’ (non-functionalized) nanoparticles [3-14]. There are experimental results of antiviral action of Ag [3-6], Au [7,11], TiO2 , CuCl2 , CeO2 [11-14], SiO2  nanoparticles against different viruses: influenza virus H3N2 and H1N1 [8,11], hepatitis B virus , herpes simplex virus [4,11], HIV-1 [5,6], dengue virus type-2 , Foot-and-Mouth disease virus , vesicular stomatitis virus . Microscopic studies demonstrated that nanoparticles are adsorbed on the virus surface [6,7], which leads to local transformations of the surface, such as agglutination of glycoproteins [6,7], thus preventing virus penetration into the cell. It is interesting that Ag nanoparticles demonstrated better antiviral action as compared to Ag ions  due to nanoparticle adsorption on the virus surface. However, the mechanism of this action and adsorption is still not clear. The analysis of the results of antiviral activity of different nanoparticles – metallic, oxides, dielectric, and polymers – allows us to suggest that there is a general mechanism of action of nanoparticles on viruses. The fact that nanoparticles of small sizes demonstrated the bright antiviral effect but large nanoparticles did not demonstrate antiviral effect  comes up with an idea of the field action of nanoparticles through the effect of local-field enhancement . The concept of mechanism of antiviral effect of nanoparticle was proposed in our previous works [11,13-16]. The main idea of the concept is the action of the local field to the molecules on the virus surface. Due to the local field enhancement effect the local field gradient at the virus surface can be rather strong. Adsorption of nanoparticles to the surface of virus obviously is the main condition for antiviral activity of nanoparticles. The principal characteristic of the adsorption is adsorption potential . The different mechanisms can lead to attractive and repulsive parts of adsorption potential of Van der Waals or Kazimir interaction, which is the reason of formation of the stable configuration between two nanoparticles (the virus and nanoparticle in the cases under consideration). Note, the both Van der Waals and Kazimir-Lifshitz interactions have an origin in the fluctuation processes in the vacuum and in the materials [18-19]. Then the formation of the stable configuration between two nanoparticles can be realized, for example, by the proper choice of materials. Indeed, when due to fluctuation the inhomogeneous distribution of electric charge (e.g., dipole moment or polarization) arises at the object (e.g., the nanoparticle), it immediately induces the electric field at the opposite object (the slab in the case of Kazimir-Lifshitz interaction, or the other nanoparticle in the case of Van der Waals interaction) which is the reason of arising of the dipole moment. The interaction between the dipole moments leads to the Van der Waals or Kazimir-Lifshitz forces. The same mechanism of appearance of the Van der Waals or Kazimir-Lifshitz forсes is due to fluctuation of the vacuum field. The Kazimir-Lifshitz force between two slabs can be either attractive or repulsive . Due to the rather high value of nonlinear susceptibility of nanoparticles, the interaction potential of Van-der-Waals interaction has both attractive and repulsive parts . There are also other reasons for arising of the repulsive part of Van der Waals or Kazimir-Lifshitz forсes . The stable configurations between the virus and nanoparticle(s) are formed when the distance between the virus and nanoparticle is about linear dimension of the nanoparticle, i.e. 1-10 nm. This means that chemical bonds between the virus envelope and nanoparticle are not formed mainly. The local-field enhancement effect in the system of two nanoparticles can form rather strong domains (hot spots) at the virus surface. Furthermore, the large gradients of the local field at the hot spot can arise, which may be the most important. It is well known, that the interaction between the virus and the host cell starts with virus binding to attachment factors and receptors on the cell surface, followed by lateral movement of the virus-receptor complexes and the induction of signals that result in the endocytic internalization of the virus particle . However, the conformations of the viral envelope glycoproteins and cellular attachment proteins plays a decisive role in membrane fusion [24,25] or binding to the cell  accordingly. Changes in the conformation of these molecules can prevent the virus binding to the cell, its entry or fusion of its membrane [25-28]. Such changes can be caused by the external action [27-29], e.g. high gradients of electric field. Although the idea is in a good agreement with the experimental results [11, 13-15], the hypothesis needs to be studied additionally. Another problem of using the metal nanoparticles (e.g., gold) in vivo is their toxicity to the cells and their further excretion of the body. Silica nanoparticles are well known due to their high biocompatibility and biodistribution . Thus, the work is devoted to study of the antiviral activities of different types of Au nanoparticles – covered with SiO2 shell and complex Au nanoparticle on SiO2 nanoparticle-carrier against adenoviruses. The analysis of local-field enhancement effect in antiviral activity was made in the work. The study was performed using the Human adenovirus. Human adenoviruses (HAdVs) are ubiquitous infectious DNA viruses possessing a broad spectrum of pathogenicity. More than 70 serotypes of HAdV, which cause a variety of course and severity of clinical signs of infectious disease are known. This group of viruses is able to cause diseases of respiratory, gastrointestinal and ocular systems . HAdV is able to persist in humans for a long time in latent state and can be reactivated by various factors leading to severe problems specifically in immunosuppressed individuals due to the development of generalized adenovirus infection. Human adenovirus is a convenient model for the study of inactivating agents. Adenoviruses are viruses with a non-enveloped icosahedral capsid and a double-stranded DNA genome. HAdV are very resistant to environmental factors and can stay infectious for a long time . Human adenoviruses are promising candidates for addressing health risks associated with enteric viruses in water. These DNA viruses persist within the population and are generally considered to be extremely stable remaining infectious in water for a period of time . Adenovirus is quite resistant to the environment, well able to endure low temperatures and impact of virtually all organic solvents. The European Agency for the Evaluation of Biological Products included adenoviruses in the group of test viruses, which should be used as laboratory models for research to develop disinfectants . Inoculated cell culture including MDBK (bovine kidney) and Hep-2(larynx epidermoid carcinoma) were used. Cells were grown in a medium consisting of 45% DMEM (Sigma, USA), 45% RPMI 1640 (Sigma, USA), 10% serum of cattle inactivated by heating (Sigma, USA), and antibiotics penicillin (100 μg/ml) and streptomycin (100 μg/ml). The cultivation of cells was performed according to the standard procedure . The reference strain of human adenovirus serotype 5 was obtained from the collection of the Institute of Microbiology, Medical University of Budapest. The virus was accumulated in cell culture Hep-2, titrated and stored at a temperature of – 20°C. Two types of nanoparticles (see, Fig.1) were used as colloidal solutions of different concentrations. The nanoparticles of type ‘a’ were obtained by the next synthesis method: Samples were obtained from two types of monomeric siliceous precursors, capable of sol-gel transformations and containing hydroxyl and silicon hydride or aminopropyl functional groups with reducing properties. Formation of both Au nanoparticles and inorganic silica shells in this case occurs almost simultaneously. The synthesis of samples was carried out in such a way that the final sample contained 3.5 mg of reduced gold per 10 ml of the initial silicone precursor: mixture of tetraethoxysilane with triethoxysilane or mixture of tetraethoxysilane with 3-aminopropyltriethoxysilane (Sigma-Aldrich) with amount of redox functional groups 0,021 mol/g with Mw 2500-3000 Da (Kremniypolymer, Ukraine). Under the conditions of synthesis of a 0.1 wt% of metal nanoparticles with a diameter 1.5-20 nm for amino- or hydride contained precursor, respectively, were formed. Figure 1. Two types of nanoparticles used in the experiments. a)(left) – gold sphere of 1.5-20 nm diameter shelled with SiO2 12-30 nm; b) (right)- gold sphere of 5-20 nm diameter putted onto SiO2 sphere/aggregates of 15-50 nm. The complex nanoparticles of type ‘b’ were synthesized by the developed method that allows obtaining powdered material with uniform distribution of gold nanoparticles on silica surface. The method is based on the use of the reduction properties of grafted silicon hydride- or amino groups on the surface of a disperse silica carrier for forming of gold particles from a solution of chloroauric acid without using other stabilizers and with a reduced amount of solvent as follows: Au nanoparticles precursor was dispersed in powder of chemically modified pyrogenic silica (specific surface area 200 m2/g)) with grafted groups (0.7 – 1.0 mmol/g); the gold reduction process has activated at 25-30°C and was carried out for 3 h; finally, materials was heated at 150°C for 1 h. In the case of core-shell composites (type ‘a’) the adjusted amount of chloroauric acid water solution (1 mg/ml) was added to the mixture of silanes (triethoxysilane or 3-aminopropyltriethoxysilane in mixture with tetraethoxysilane, functional groups concentration was kept at 0.7-1.0 mmol/g) or to polysiloxane with silicon hydride groups and polycondensation process was carried out at the room temperature. The amount of gold nanoparticles was 0.1 wt%. Immobilized Au particles with an average size of 5-15 nm are formed on the surface of nanosilica particles/aggregates of 15-50 nm size. Crystallinity of the nanoparticles was proofed with XRD studies. The data of mean sizes and size ranges of type ´a´ and type ´b´ nanoparticles were calculated with AFM and SEM studies. Nanoparticles concentration was calculated as a concentration of Au spheres with the diameter equal to the mean size. The results of calculations were confirmed by the AFM and SEM data. The results of the studies are presented in Table 1. It should be noted, that the numbers of immobilized Au nanoparticles and SiO2 carriers are different. This obviously, means that more than one Au nanoparticles are attached to the surface of SiO2 carriers. 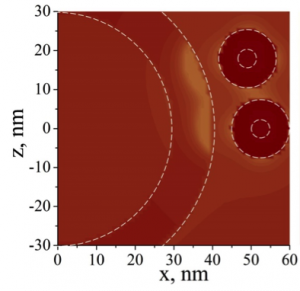 These ´complex´ nanoparticles are characterized by uniform distribution of Au nanoparticles at the surface of SiO2 carriers. The dilutions of the nanoparticles were prepared in the cell growth medium and were used immediately after preparation. As the cell growth medium RPMI-1640 and DMEM in an equal amounts without serum were used. The nanoparticles samples were added to the cells infected with adenoviruses (study of antiviral properties) or the cells were infected with adenoviruses previously incubated with nanoparticles (study of virucidal action). The MTT staining assay as described by Mosmann  was used with minor modifications. After 24 hours of cell growth and monolayer formation in 96 well plates, the cells were infected with a previously determined dose of virus of 50 μl per well. The virus was adsorbed at room temperature for 2 hours at 5% CO2. The cells which did not adsorb the viruses were washed with Henks solution. Then, the 200 μl of the 10-fold dilutions of the test nanoparticles were added. In the control wells, the medium was replaced with fresh medium without addition of nanoparticles. where is the average value of the optical density of the cell control samples, is the average value of the optical density of the virus control samples, is the average value of the optical density of the test samples for a certain concentration of the substance. The virucidal action of nanoparticles was studied as follows. The viral suspension (HAdV-5 with a titer of 2.4×107 ICU / ml, ICU is the inclusion-containing units), was mixed with an equal volume of the mother liquor of the test nanoparticles at various dilutions and incubated at 37°C for 1, 2, 3 and 4 hours. As a control, a viral suspension was used, to which an equal volume of the medium without the nanoparticles was added and incubated under the same conditions. Then, the infectious titer of the virus was determined by the cytopathic effect on the cells at the end point of the dilution. After 24 hours of growth in 96 well plates, MDBK cells were infected with ten-fold serial dilutions of the viral material in a volume of 50 μl. Adsorption was carried out at 37°C for 1.5 hours, and 150 μl of a medium without serum was added. Non-infected cells were used as a control. Plates in 5% CO2 at 37°C were maintained for 6 days until the pronounced cytopathic effect of the virus appeared. The infectious titer of the virus was determined. Reducing the infectious titer of the virus by 50% or more, compared with the control, indicates a virucidal effect. The statistical analysis was performed according to standard approaches of the calculation of the statistical error (standard deviation) using the Microsoft Excel 2007 software. Screening of the antiviral activity of the nanoparticles was carried out by introducing different concentrations of the nanoparticles to cells after the virus adsorption. The study was conducted in a range of dilutions, which are non-toxic to the cell culture. The levels of adenovirus inhibition in the presence of the nanoparticles on the culture of MDBK cells are shown in Table 1. The carrier particles, namely SiO2, demonstrated no activity. As NPs of ‘b’-type were the most active, virucidal effect of the NPs after the treatment of the virus for 1, 2, 3, 4 hours was analyzed. The results are shown in Table3. Table 3. Virucidal effect of the ‘b’-type nanoparticles. The obtained results indicate that incubation of virus and nanoparticles for two hours is the most optimal, since a stable 66-86% virucidal effect was observed under these conditions. The possible reasons of the decrease in the inhibition efficiency after four hours of incubation will be discussed below. The virucidal effect represents one of the complex antiviral effects of the nanocomposite based on the blocking of the extracellular virus. However, a broader spectrum of the antiviral effect of ‘b’-type nanoparticles as the rate of its direct anti-adenoviral effect is much higher. As it was mentioned above, one of the main mechanisms of nanoparticles-mediated antiviral activity may be linked to local-field action against the receptors at the virus surface. It should be noted that the phenomena demonstrated by nanoparticles in medium with viruses occur inside the multicomponent colloidal solution that possesses the features of electrolyte. Nevertheless, the effect can be described in terms of simple models. The effect of nanoparticles on the infectious activity of viruses appears to be complex, consisting both of field (physical) influences and of biochemical processes. It can be argued that under all circumstances, the field mechanism operates at the initial stage of the interaction of the nanoparticle with a virus. As it was mentioned above, the nanoparticle and the virus form the stable system. Then two scenarios can take place. 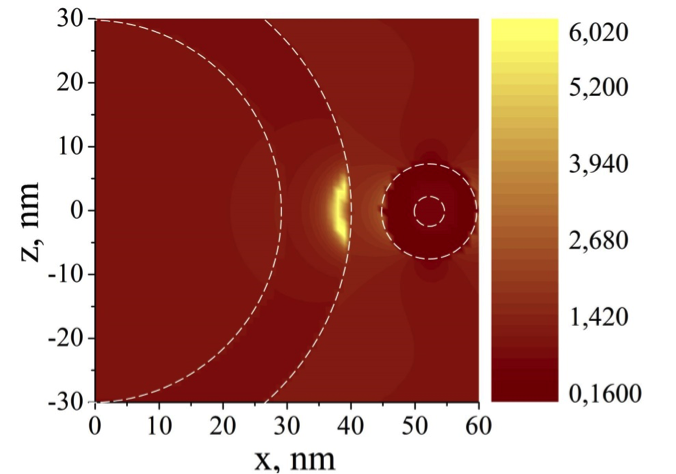 Since the interaction potential has a minimum at the distance between the nanoparticle and the virus of the order of the nanoparticle size (i.e. several nanometers), there are no direct chemical bonds between the virus and the nanoparticle. Then, it can be supposed [11,13-15], that the inhibition of viral activity is mainly due to field effects. For example, under the action of an amplified local field on the virus surface, its receptor molecules may lose the ability to “open” the cell membrane and the virus cannot penetrate into the living cell similarly to the virus lacking gD is less stably bound to cells . The minimum of adsorption potential of nanoparticles to the surface of the virus is at a short distance from the surface of the virus. The nanoparticle can approach the surface of the virus at a distance at which the chemical bonds occur. Then there may be many ways to influence the nanoparticle to the virus. For example, photocatalytic reactions between nanoparticles and receptors at the surface of the virus may occur, resulting in the receptors being damaged or destroyed . Note, that the action of nanoparticles can also be transmitted inside the cell if the virus with the adsorbed nanoparticle still penetrates the cell. Nanoparticles can block, for example, the replication of viral DNA (RNA)  and thus reduce the infectious activity of the virus. a colloidal solution. For example, the presence of a double layer of electric charges on the surface of the particle must be taken into account . As it is known, the value of the electric charge in the double layer is determined by the z-potential of the colloidal solution [44-46]. In electrolytes, an increase in the z-potential is observed. Moreover, the characteristic size of the z-potential localization near the nanoparticle is determined by the Debye screening length, which in turn depends on the ionic strength of electrolyte I, namely . For sufficiently dense electrolytes, the value of Debye screening length does not exceed 1 nm. Hence, this effect is reduced to the presence at nanoparticle of a thin shell formed by a double layer of ions near the surface of the nanoparticle. That is, the calculation of the effective susceptibility of nanoparticles should be made taking into account the presence of a thin shell , whose dielectric constant is formed by the movement of ions in solution near the surface of the nanoparticle. For sufficiently dense electrolytes, the ion movement is strongly limited and thus the dielectric constant of the shell can be considered as small. Consequently, the shell of 1 nm thickness can be neglected for rather big sized of nanoparticles. Furthermore, the direct numerical calculations confirm that an influence of so thin shell is negligible. However, for small Au nanoparticles of type ‘b’ composites the thin shell was taken into account. with electrodynamic Green function of solution in which the virus and nanoparticle are embedded, linear response to the external field (the effective susceptibility) of the virus which we considered as shelled sphere, and Vv virus volume. RV is the point of virus location. The local-field distribution in the system ‘adenovirus – ‘a’-type nanoparticle’ is shown in Fig.2. We can see ‘hot spot’ (the domain of enhanced local field) at the virus capsid. 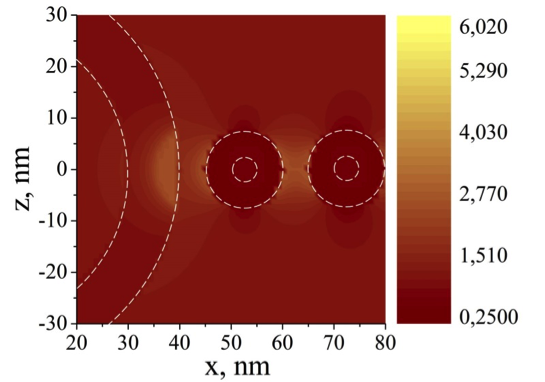 The local-field distribution in the system ‘virus – ‘b’-type nanoparticle’ is shown in Fig.3. The difference between the local-field images obviously is due to the shape influence on the local-field formation. Figure 2. Local-field enhanced in the system adenovirus-nanoparticle ‘a’-type. Figure 3. Local-field enhanced in the system adenovirus-nanoparticle ‘b’-type. We can see the effect of shape, because in this case the hot spot at the virus surface is more intensive and takes less area. If one looks carefully at the results of experiments on antiviral action of nanoparticles (see Tables 2, 3), then one can see that there are optimal concentrations (dilutions) of nanoparticles with the maximum antiviral action. Obviously, in the case of small concentrations, the weak antiviral action of the nanoparticles is due to a small amount of damaged viruses – the number of nanoparticles is lacking. The weakening of the antiviral effect of nanoparticles with a high concentration is most likely due to the effect of “screening” the action of nanoparticles on the virus from other nanoparticles. We can assume that there can be a large number of configurations in the system of the “virus-several nanoparticles”, which lead to weakening of the action of one nanoparticle and thus domains of the enhanced local field disappear. This is easily demonstrated by the example of two nanoparticles near the virus (Fig. 4). 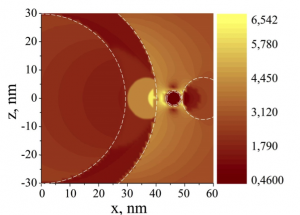 Indeed, there are hot spots at the virus surface formed by one nanoparticle in Fig. 2. But the hot spots become less intensive where other configurations realize (Fig. 4). Because the number of configurations with “screening” local-field enhancing effect is more than the number of configurations in which the local-field enhance effect observed, the proposed model can describe the weakening antiviral activity of nanoparticles of high concentrations. Another interesting result is the nonmonotonic dependence of antiviral activity of nanoparticles on exposition time (see, Table 3). This dependence can obviously be explained by complex processes occurring in the colloidal solution of niposothomes and viruses in the nutrient medium. Since due to our hypothesis the interaction of nanoparticles with viruses can lead to conformational changes of molecules on the virus surface, this can lead to a change in the charge state of the virus surface. As a result, a coagulant can be formed around a virus-nanoparticle system eventually increasing its size. It is well known, that the local field between small nanoparticles is higher than between the virus and the nanoparticle. Then, the nanoparticles mainly form coagulants with each other. The process of coagulation, since it occurs in a colloidal solution, takes rather large characteristic times. As a result of the coagulation the nanoparticles become larger and their number decreases. Bigger nanoparticles in smaller concentrations are worse antiviral agents, so with an increase in exposure time the antiviral effect reduces. Obviously, the similar mechanism of nonmonotonic dependence of antiviral activity of nanoparticles on their concentration can be proposed to explain the results shown in Table 2. A decrease in the inhibition efficiency after four hours of incubation also may suggest a possible dissociation between particles and the virus. At the same time, the irreversible conformational changes on surface virus epitopes are not expected to occur. Note, the heterogeneity of the systems under consideration plays an essential role in the effects observed in the experiments. Indeed, the local field enhancement effect is observed in strongly inhomogeneous systems, then in heterogeneous systems too. On the other side, the repulsive forces stabilizing the dispersions (which are the systems under consideration)  play an essential role in formation of the stable system “nanoparticle-virus” which is the important moment in the model for explanation the antiviral and virulicide activities of nanoparticles. Moreover, as we mentioned above, the nonmonotonic behavior of antiviral activity and virulicide action of nanoparticles is explained by the effect of coagulations in the colloidal solution which is determined by stability of colloids. Figure 5. Local-field enhancement in the system ‘adenovirus – 2 ‘a’-type nanoparticles’. Left: symmetric; Right: shifted. The problem of creating antiviral effective drugs against adenoviruses is relevant and difficult to resolve. The attention of researchers is aimed at creating antiviral drugs based on nanoparticles. Nanoparticles, since they are not directly related to chemical interactions, give hope for the creation of drugs against which viruses cannot resist due to mutations. On the other hand, the effect of metallic nanoparticles on living organisms is not sufficiently studied yet. Therefore, when studying the antiviral properties of nanoparticles, one must bear in mind the problem of toxicity of nanoparticles. One of the ways to solve this problem is to remove nanoparticles from the living organism. Therefore, we studied the effect of Au nanoparticles in a SiO2 shell and complex nanoparticles where a larger SiO2 nanoparticle carries a small Au nanoparticle on adenovirus. It was shown that both types of nanoparticles demonstrated good antiviral properties. Complex Au-SiO2 nanoparticles (nanoparticles of ‘b’-type) demonstrated the strongest antiviral activity. It has been determined that such complex nanoparticles that have a strong antiviral effect are not accumulated in living cells, proving non-toxicity of such antiviral nanoparticles.